Alameda’s long conversation about cannabis has finally reached the action phase. Carrie Tillman is glad to have her left arm intact today. Acute nerve damage stemming from a shingles infection had left her in debilitating pain, and a brutal yet ineffective medication regimen almost brought her to the point of amputation — until a new doctor encouraged her use of medical cannabis. Gradually, she cut out more harmful prescriptions, and was able to start a genuine recovery process. Tillman now works as a cannabis health advocate for Portman Enterprises, an investment firm looking to open cannabis storefronts in Alameda. 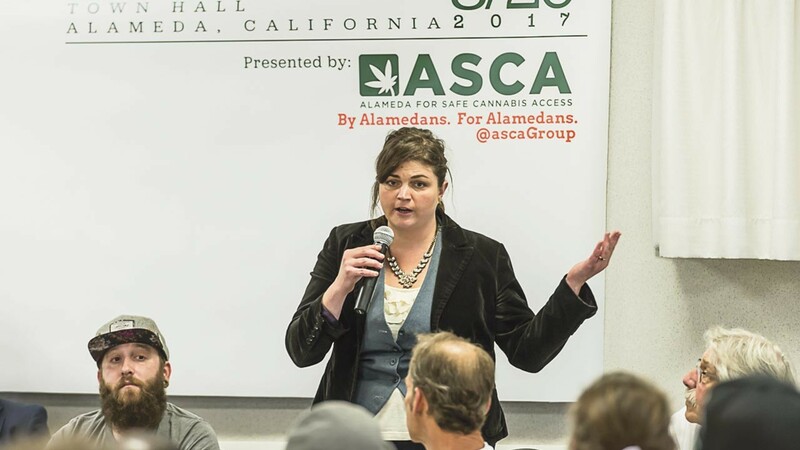 "I'm very excited about the future of cannabis in Alameda," Tillman said. "People are coming around to a lot of the therapeutic benefits, but the stigma is preventing a lot of legitimate businesses from opening up." Following the passage of a new city cannabis ordinance on April 2, a series of procedural squabbles has finally been settled, ending months of uncertainty. The thicket of complex legal conflicts emerged from seemingly trivial stakes — essentially, how soon after the opening of a third cannabis dispensary the city would grant a permit to a fourth one. Last October, the City Council adopted an ordinance that would have allowed up to four dispensaries to open on the island — with two required to offer, but not restricted to, delivery services. Enter Serena Chen, a health policy consultant with experience in tobacco safety regulations who filed multiple complaints with Alameda's Open Government Commission after a wrinkle in state law blurred the distinction between storefront and "delivery-only" dispensaries. The city's noticing initially implied that the additional permits would only be available to delivery services, but after the City Attorney explained that this would apply to any type of dispensary, Chen objected to the manner in which the ordinance was approved. Twice in early 2019, the City's Open Government Commission agreed unanimously with her, declaring the ordinance null and void. "I'm not against loosening the regulations — I'm just against these weird ways of loosening them," Chen said. "If we're bringing marijuana into the city, we should do it in a way that takes into account all the lessons we've learned from not regulating where alcohol outlets have gone, [and] from not regulating where tobacco is available." When the ordinance came back before the new council in January, it failed to pass. Newly elected Vice Mayor John Knox White sought to amend it to withhold by one year the issuance of a request for proposals for a fourth dispensary. Councilmember Jim Oddie disagreed, insisting that "the market should determine" how many dispensaries Alameda could sustain. Knox White then delivered the decisive vote against the ordinance, leaving the legal status of storefronts on the Island in limbo for several more months. "If someone can tell me why four is the right number, and there's an objective reason beyond 'more is better,' I might be convinced," Knox White said. "Let's see if we can even get three to open." Knox White noted that the city's economic analysis on cannabis found that its permitting program could start with three or four dispensaries. Tillman, on the other hand, pointed out that the same analysis found that city services could sustain up to six businesses. Current economic best practices estimate that cities can sustain roughly one cannabis dispensary for every ten thousand residents. But that rule doesn't always hold firm. In nearby Emeryville, the town of just 10,000 residents decided to permit two dispensaries within its borders. Councilmember John Bauters explained that Emeryville's unique economic situation led to a higher ratio. "Emeryville recognized that despite our relatively small population, our daytime population is nearly triple the size of the residential population," Bauters said. "Some members of council felt that this mix of local and regional presence merited having two dispensaries that touched different parts of the cannabis market." Finally, on April 2, Knox White and Oddie hacked out a final compromise that mustered the three votes needed to pass. The City will now permit four dispensaries to operate in Alameda, but will delay the permitting of a fourth dispensary for several months after the third one opens its doors. In her dissent, Mayor Marilyn Ezzy Ashcraft indicated that she hoped to revisit the City's "buffer zones" policy and how it codifies restrictions around youth centers. City leaders have been struggling to thread the needle between safety concerns regarding cannabis sales near young children, and welcoming businesses in a thriving industry that is otherwise struggling with complex regulations. The legacy of federal cannabis criminalization under the Nixon-era War On Drugs doesn't help matters. The ongoing dispute over potential cannabis businesses — particularly near recreation centers and religious institutions that serve small children — has the CEO of Portman Enterprises eager to operate clearly on the right side of the law. "Landlords do have a legitimate concern given the nature of federal regulations and banking," said CEO Mark Hersman. "Our feeling is, you have to look at the protection from youth in the context of all the regulations that are there — child-resistant packaging, guards at the door checking IDs, all of the safeguards that are already there," Hersman said. Moreover, local regulations empower Alameda's Chief of Police to unilaterally revoke permits and close down a business if cannabis products are found in the hands of underage users nearby.